As part of the NPDUIS initiative, the PMPRB monitors new drugs in development as well as international drug launches to identify drugs that may have an impact on future expenditures in Canada. Building on the success of its established publication, the New Drug Pipeline Monitor, the PMPRB is now expanding its suite of products to include the New Drug Launch Monitor and the Orphan Drug Launch Monitor. The NDPM provides information on drugs currently under development that may have an impact on future drug plan expenditures in Canada. Each report contains a list of pipeline drugs identified as part of a search of the BioPharm Insight® database as well as a review of pharmacy literature, with a focus on Canadian studies. Selected drugs are in Phase III clinical trials or under review by the US Food and Drug Administration (FDA) and demonstrate the potential to have a significant clinical impact. Each new edition of the NDPM updates the list of drugs from previous editions, highlighting drugs that have been approved or have been taken out of consideration. Six editions of the NDPM have been released to date. The most recent edition, published in December 2014, updates the 31 drugs identified in previous editions and identifies 10 additions to the list, 3 of which are biologics. 11 were excluded from the list based on the NDPM criteria. The NDLM complements the NDPM by identifying drugs recently launched in foreign markets and not yet available in Canada, but expected in the near future. The report provides an early assessment of foreign availability, market uptake and price levels. The analysis reports sales data from the IMS AG’s MIDAS™ database for all drugs recently launched in the seven countries the PMPRB considers in reviewing and reporting on the prices of patented drug products: France, Germany, Italy, Sweden, Switzerland, the United Kingdom and the United States. Less than half of these drugs were introduced in Canada; those that were account for most of the international new drug sales. While the US is generally the country of first launch, the Canadian introduction usually follows closely, with brief delays relative to other foreign markets. The higher the drug revenues, the shorter the lag to launch in Canada. 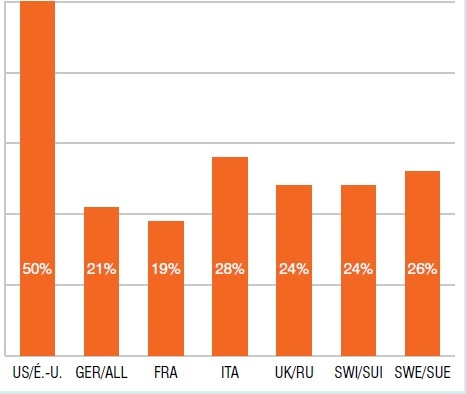 This bar graph gives the percentage of new drug launches since 2009 by market and relative importance in terms of international sales in Q1-2013. 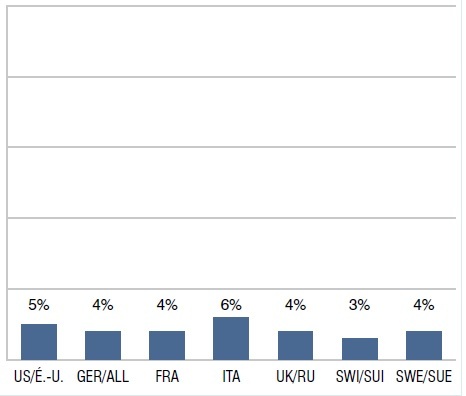 For each country the percentage of drugs launched is listed with the relative importance of the basket in parentheses. CAN: 46.7% (93.3%); FRA: 30.4% (76.5%); GER: 71.7% (93.3%); ITA: 27.2% (42.9%); SWE: 62.0% (88.5%); SWI: 48.9% (84.6%); UK: 47.8% (84.7%); US: 79.3% (99.0%). This scatter graph illustrates the drug introduction lag in Canada for new drugs launched since 2009. The international sales for each new drug in Q1-2013 are given on the y-axis (ranging from $0M to $350M), and the number of months between the initial launch and the introduction in Canada is given on the x-axis (ranging from 0 to 35). Drugs with higher sales had a relatively short lag time (<5 months). There is a cluster of drugs with sales of less than $50M with a lag time from 3 to 13 months, but some lower-sales drugs took as long as approximately 35 months to be introduced in Canada. The ODLM focuses on orphan drugs that have received market approval in the Unites States and the European Union, assessing the extent to which these drugs are available in Canada, and reporting on pricing, market penetration, patent availability and launching decisions. Sources for the data include the IMS AG’s MIDAS™ database for the PMPRB-7 countries and Canada, the US FDA Orphan Drug Product designation database and the European Community Register of Orphan Medicinal Products. The US approved the most orphan drugs. US approved orphan drugs account for a large share of drug sales, especially in the US. 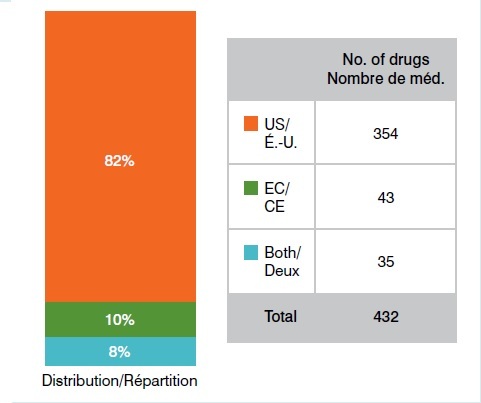 Drugs with approved orphan designation in both the US and EU only account for 3% to 6% of drug sales. This graph gives the number of approved orphan drugs in the US and EU as of October 1, 2014: US: 354; EC: 43; both US and EC: 35. This bar graph gives the international share of sales for drugs with US approved orphan designation in Q1-2013. US: 50%; GER: 21%; FRA: 19%; ITA: 28%; UK: 24%; SWI: 24%; SWE: 26%. 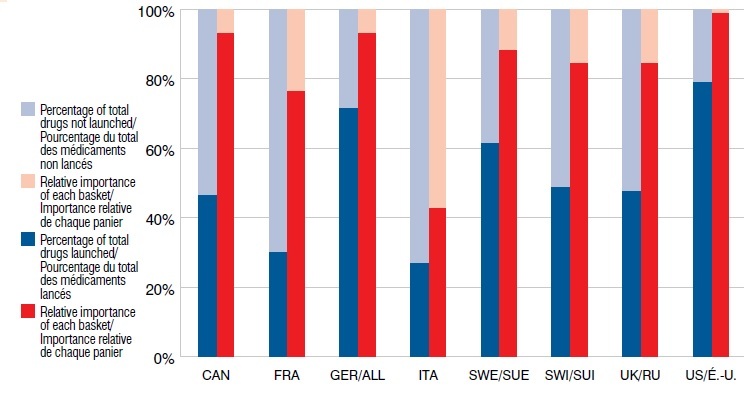 This bar graph gives the international share of sales for drugs with both US and EU approved orphan designation in Q1-2013. US: 5%; GER: 4%; FRA: 4%; ITA: 6%; UK: 4%; SWI: 3%; SWE: 4%.